Problems Overhead: What’s Causing Your Ceiling Damage? Only second to your roof, ceilings provide much needed overhead protection from the elements, extreme temperatures, and debris floating in the air. They also hold insulation in and keep unsightly beams and pipes undercover. 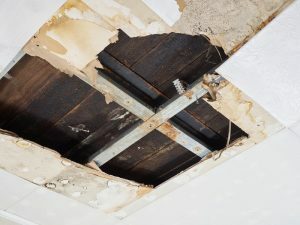 While you may not give your home’s ceilings much thought day to day, when they start to show signs of ceiling damage, they are sure to move up the priority list. ● Ceiling stains: If you’re ceilings are painted a nice bright white, any discoloration is sure to attract the eye. Ceiling stains come in different colors and shapes, but when they appear, there’s no denying something’s not right. ● Ceiling cracks: Looking just as it sounds, cracks can form in the ceiling. Some may form in a spiderweb pattern while others may long straight lines. ● Bowed ceilings: For the most part, ceilings should be level and straight. If your ceiling is sagging or beginning to take dip, you’ve likely got bigger issues. ● Peeling paint: Unless your ceiling hasn’t been painted in decades, if your ceiling paint job is flaking, cracking, or peeling, it could be a sign of trouble. Problems overhead can be caused by a number of issues, many of which will require your immediate attention. Ceiling stains, sagging drywall, and peeling paint typically mean water is sitting atop your ceiling drywall. Roof damage, including missing shingles, clogged gutters, and ice dams, are one culprit. The source of the problem could also be a broken pipe or an improper shower fitting allowing water to leak from an upstairs bathroom. 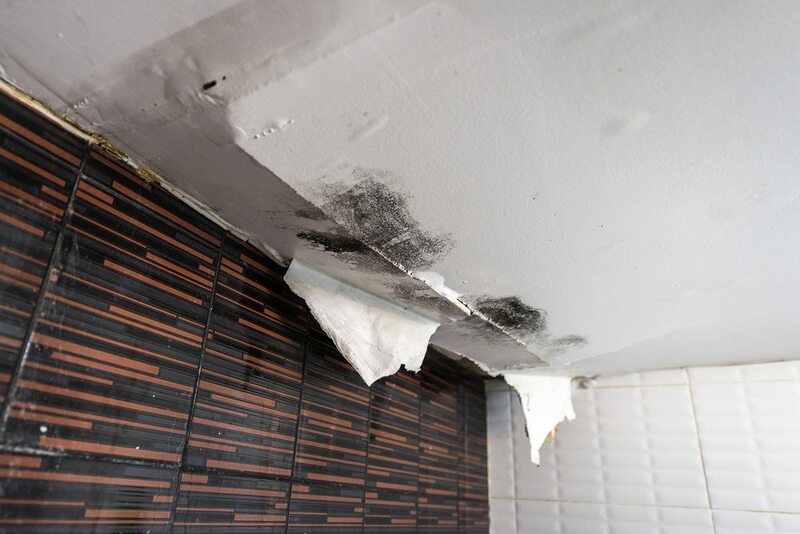 Address this kind of damage by first determining and fixing the water source, then drying out the area, and last repairing the ceiling damage. Water leaks aside, ceiling stains can also be caused by areas of your home having too high humidity or condensation. Damp rooms, such as bathrooms and kitchens, can lead to mold- and mildew-stained ceilings. Avoid this from happening by installing proper ventilation and using a dehumidifier if necessary. When installing exhaust fans, make sure the duct to the attic space is properly insulated to avoid the moisture from turning into condensation stains. Cracks that run the full length of the ceiling in a straight path and then continue down a wall, may be a sign your home is settling improperly or a wall stud is damaged or weak. If the ceiling begins to dip or bow, your home’s joists may no longer be able to hold the weight of your home. For either issue, have the structure of your home inspected and repaired to avoid much larger (and more expensive!) problems. Just like the human body, a house doesn’t always age gracefully. While humans take on wrinkles and weakened bones, homes show their age in cracks. These typically present in a spiderweb pattern or short hairline cracks. For aesthetic purposes, you can mend these eyesores with drywall mud or plaster, and paint. Otherwise, these ceiling cracks shouldn’t pose much problem, unless they start growing in size.